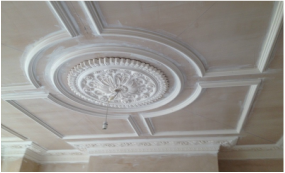 With a family tradition that began in the North America since 1956, Decor Mouldings Company has been creating plaster coving, cornices, plaster mouldings and decorative stone gypsum coving art in The UK since 1995. Decor mouldings plaster coving shop, longevity and reputation proves our commitment and passion toward interior and exterior architecture and on-going interest in dealing with people and companies who appreciate quality in design, products and service. In recent years Decor Mouldings Company, has used its extensive knowledge and experience in the architectural plaster coving and cornices industry to develop a line that caters to many tastes and economic levels. Particular efforts have been taken to ensure the highest quality materials are used to ensure the end user will enjoy their plaster coving and cornices for years to come. Our new procedures bring the installation to many of our plaster coving and cornices from mason, down to handyman, so not only will you receive superior product, but you will save on installation costs. Decor Mouldings Company has participated in many prestigious projects through the years and is a company that is built on reputation. We pride ourselves on our reputation of service, which is second to none and we are known to stand behind our product. This site is intended to show some our plaster coving, cornices and decorative plaster mouldings products and services. Should you require further information or design suggestions, please contact us and we will be happy to assist you. We are looking forward to working with you on your next project. Plaster cornice or coving beautify, enhance the ceiling in any room of period or new build property. Is good to cornice the entire perimeter of the room in order to achieve the shape and beauty. At period Victorian properties sash windows are very close to the ceiling and most likely cornicing cannot be installed. The way to finish the whole perimeter of the room is to generate a cornicing valance (see image below). By doing so you are framing with cornice the entire ceiling and here you have accomplished your desire propose of cornicing. As a guide of coving style and size to use it is complex in our days. Please shop cleverly and chose the right plaster product for your period property. In our Coving shop we have cornicing examples and display, therefore please feel free to visit us (by appointment only) to compare the quality and to be well satisfied with your coving choice. Here at Décor Mouldings we manufacture all our plaster products with traditional methods. Please browse our new website covingshop.com and let us know your experience, we are always here to help. Proudly we are the Britain's fine superior plaster coving manufacturers and coving suppliers, range’s from Victorian coving to period coving styles, like plaster cornices and decorative plaster mouldings. Please visit our coving shop’s showroom to view our authentic and traditional Georgian, Edwardian and art deco coving styles, ceiling roses and more. All our plaster products are manufactured and delivered from our coving company by us direct to your door: City of London and Greater London, Brighton, Essex, Surrey, Kent and throughout the UK. We specialise in period plaster mouldings and restorations since 1956.